Dr. Laura Foster recently spoke at the Annual Meeting of Force 11: The Future of Research Communications and e-Scholarship in Portland, Oregon from April 17- 19, 2016. Dr. Foster spoke about the joint research project on Indigenous Peoples’ Knowledge, Climate Change, and Intellectual Property between Natural Justice, IP Unit at University of Cape Town Faculty of Law, Indiana University - Bloomington, and the Griqua and Nama Nations of South Africa. The project is funded by the Open and Collaborative Science in Development Network (OCSDNet) through the International Development Research Centre (Canada) and iHub (Kenya). Foster shared insights from the joint research project on a panel about success stories in research and knowledge communication from outside Europe and North America and how those stories inform ways of improving research communication globally. Dominique Babini, Dora Ann Lange Canhos, and Juan Pablo Alperin also joined the panel and spoke on similar issues. 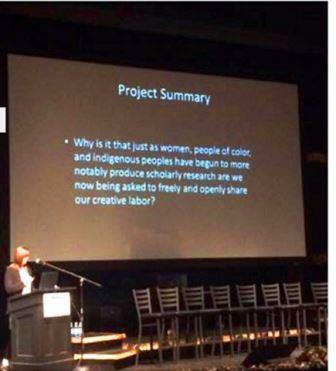 In her remarks, Foster provoked the audience to consider how histories of colonial violence against indigenous peoples require us to think differently about notions of open and collaborative science. In particular, she highlighted how insights from the Indigenous Peoples’ Knowledge, Climate Change, and Intellectual Property project demonstrate the need for a more critical approach or what might loosely be called a “situated openness.” This concept draws upon Donna Haraway’s notion of “situated knowledge” and insights from feminist science studies and indigenous methodologies. Foster argued that a situated openness requires a way of doing research that assumes knowledge production is situated within particular historical, political, and socio-cultural relations. It considers how open and shared knowledge practices can democratize knowledge, while also recognizing how such notions are embedded within colonial histories that explicitly deployed openness as a way to legitimate the taking of indigenous peoples’ knowledge. Furthermore, it aims to develop practices of knowledge production that are more responsive to contesting hierarchies of power and inequality, so collaborative research production might involve simultaneous modes of being open, closed, sharing, and restrictive. In other words, the Indigenous Peoples’ Knowledge, Climate Change, and Intellectual Property project is working towards a more robust notion of situated openness in order to democratize science in more meaningful ways. Dr. Laura Foster (@DrLauraAFoster) is Assistant Professor of Gender Studies at Indiana University, where she is also Affiliate Faculty in the IU Maurer School of Law and African Studies Program. She is also a Senior Research Associate in the Intellectual Property Unit at University of Cape Town Faculty of Law. Her current book project examines how contestations over patent ownership rights, Indigenous San knowledge, and Hoodia plants in South Africa present emerging sites of struggle over who does and does not belong.